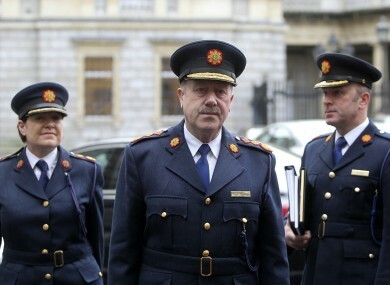 GARDA COMMISSIONER MARTIN Callinan has said he will take legal advice over the likely appearance of two garda whistleblowers before the Public Accounts Committee (PAC) over the penalty points controversy. Speaking to TDs on the PAC today, Callinan said that it was “extraordinarily unfair” that it was the intention from the Oireachtas committee to hear evidence from a serving garda and a former member of the force over allegations of widespread corruption in the termination of penalty points. He said it was “quite disgusting” that two people out of a force of 13,000 people are making “extraordinary serious allegations” and there is not “a whisper” from elsewhere in the force of “corruption or malpractice”. “On a personal level, I think it’s quite disgusting,” Callinan told the independent TD Shane Ross. He also raised “very serious concerns” about data passed to the committee by the whistleblowers, saying that his advice is that it breaches the Data Protection Act. PAC chairman John McGuinness said that following legal advice the evidence has been made available to committee members in redacted form and that he would be willing to share a copy of this redacted information with Callinan. Callinan said there were obligations on these “so-called whistleblowers” to use internal garda reporting mechanisms to highlight “matters of wrongdoing”. He said it would be “fundamentally wrong” for any member of the force to use the committee to make allegations that have been “unsubstantiated”. The Commissioner said that it is “grossly unfair this situation has involved” where the whistleblowers will appear before the committee and said he “clearly will have to take legal advice”, as well as reserving the right to take disciplinary action against those who have made allegations. He said this would have an adverse effect on maintaining of “discipline and order” and added that it is his view that he “shouldn’t be usurped by subordinates”. McGuinness said that the committee had not yet decided whether they would hear from the whistleblowers in public or in private session but said that one of them will appear next week, pending legal advice, and a second has indicated a willingness to appear before the committee. Email “Callinan: Whistleblowers’ penalty points allegations are ‘quite disgusting’”. Feedback on “Callinan: Whistleblowers’ penalty points allegations are ‘quite disgusting’”.